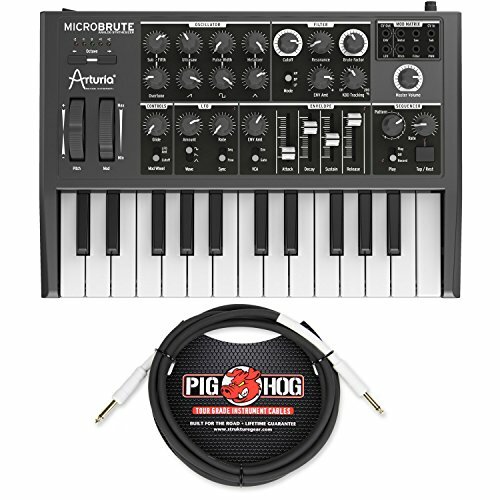 After Arturia succeeded with synthesizer called MiniBrute, they came with even smaller version called MicroBrute. However, small dimensions does not mean that the instrument is bad or that it does not perform well. On the first look MicroBrute looks like a toy, because of really small keys. Somebody could consider this as a problem, but don´t worry. Even with the small keys you can get solid performance. Downsizing the dimensions also hit the other controll knobs and buttons, but on the other hand, we don´t only have some things missing – there are also some new things in compare with MiniBrute. For example sequencer or CV panel. On the back side of the instrument you can find some standard ports and connectors. MIDI port allows input, while USB also allows output signals. There are also ports for connecting external audio-in and out devices. The top left part of the device is dediated for oscillator controls, while on the right side you get a filter module that allows better adjustments of the final sound. There is also a way to adjust parameters and effects. Although the options are not as wide as on standard-sized synths, MicroBrute is still able to perform well. The bottom side of control panel features sequencer, LFO and envelope functions. But what is it really like to play it? With MicroBrute you get two octave keyboard of miniature size. For somebody who has ever played standard keyboard it will look and feel weird, but it´s not that hard to get used to it. However, it´s no problem to connect external midi keyboard of standard size. The price for this instrument attacks 300€. In our opinion that´s quite fair and solid price for what MicroBrute offers, because once you master it you can use it with no restrictions. Of course it wouldn´t be equal to standard full size synths, but as a secondary synth it´s a good choice.